Did you use the wrong tactics or were the tactics badly executed? Are you measuring the metrics that matter to you or to metrics you heard someone else was measuring? Are you just looking to impress your boss or are you sincerely looking for ways to improve your community? 1) Don’t measure anything you don’t have a process to improve. If your metric rises or falls, what will you do differently? You have four options, decide which before you collect the data or your emotions will get in the way. 2) Don’t open an analytics package before you know what to measure. You can spend hours making interesting observations which don’t matter. Sometimes no change shows tactics aren’t working. Decide what you’re measuring before you open the analytics package. 3) Don’t measure someone else’s strategy. If you measure the same things as someone else, you’re measuring someone else’s strategy. You need unique metrics for your strategy. The next four rules use the hierarchy of measurement. 4) Measure if your tactics were well executed. First, measure if your tactics had good reach (a high % of people were aware of them), depth (they affected a high % of the target audience), and length (they were effective for a long time). If not, you need to improve the execution of tactics. Engagement-level metrics are useful here. 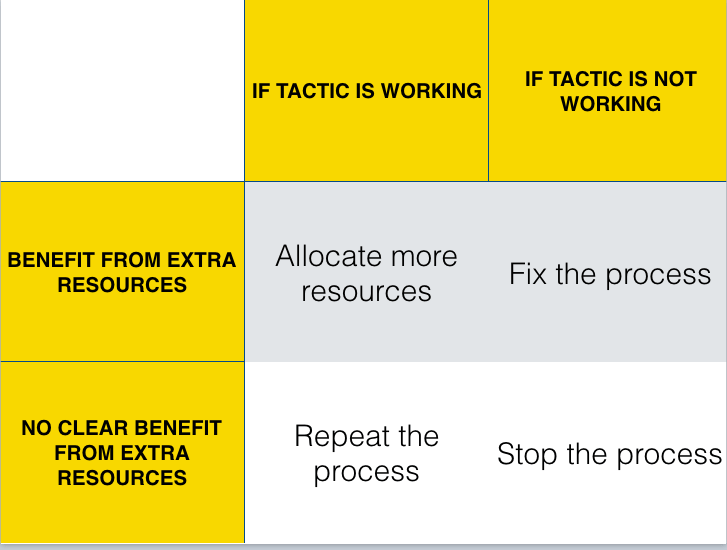 5) Measure if your tactics achieved your strategy. Second, did the tactics influence how people feel about the behavior you want? If not, you need different tactics. Emotion drives behavior, tactics should influence emotions. Survey data and sentiment analysis are useful here. 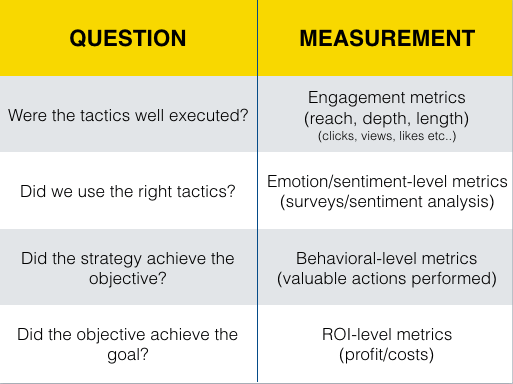 6) Measure if your strategy achieved your objectives. Third, did the strategy cause more people to perform valuable behaviors (answering questions, sharing knowledge, etc..). If not, you need a different strategy. These are the direct antecedents of ROI. 7) Measure if your objectives achieved your goal. Fourth, did the objectives create a positive return on investment for your online community? If not, you need different objectives. Hint: The last three rules require you to establish at least strong correlation with the metric above (or causation by not exposing a random sample of members to the tactic). Measurement isn’t easy, but when do well it saves you an incredible amount of time. It lets you focus on the key things which drive results. Even better, build your own custom dashboard (or get help) and share it with your team. Now everyone can focus on the actions that matter.